Hoye suggests a rebound in the S&P 500 from the hit in Christmas would be expected, and that is what happened. But, Hoye further suggests that as of a week ago the S&P became over bought. Through all this, gold is acting well. This correction in the S&P can go on for a bit. 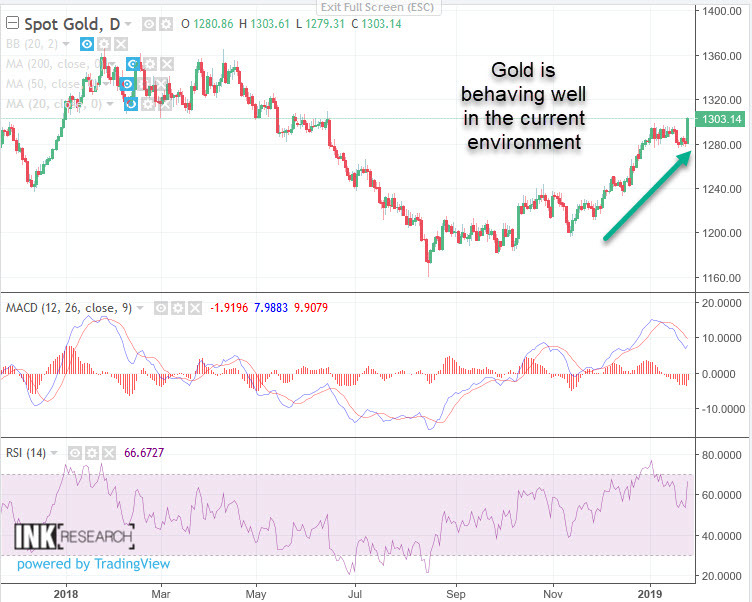 We are seeing also with gold there is a tendency that when there is a set back in the stock market, for gold to go up. He suggests that could set the stage for gold shares to go in the opposite direction of the stock market. In a post-bubble contraction, eventually the real price of gold goes up as most everything falls relative to gold and that helps with profitability in the industry, and even increases production. One of the things about a post bubble contraction is that the gold sector does well. Right now, Hoye is watching the real price of gold and the T-bill yield. He suggests too much attention is being placed on the Fed. Too much of the investment world focuses on what the Federal Reserve is going to do to interest rates. What are interest rates going to do to the Fed? What history shows in volatile financial markets such as we’re in, the senior central bank is typically a number of months behind the changes in market rates of interest. A key development for Hoye is the recent reversal in Treasury bill yields. Hoye notes the 3-month T-bill made it to about to about 2.46%. On Thursday he alerted clients that it looked like the yield was rolling over and as of Friday it had indeed dropped to about 2.38%. Hoye suggests that it is going to be interesting to hear how the Fed will come up with a rationalization for following the market rate down with a change in the administered rate. So, that will be interesting because they have had all sorts of stories about raising rates. But, I think they’ve been just following interest rates up and then they will follow them down. At some point, Hoye thinks the public will look at all of the trillions of tax dollars that policy markers have thrown into the financial markets in order to stop bad things from happening. Now a bad thing has been lately a hit to the stock market. The next bad thing would the discovery of a slowing economy. On crude oil, Hoye suggests because we are almost out of January, the worst of the seasonal part for crude maybe over. We can have crude in a rising trading range say out to March, same thing for the base metals. This would be a rally in a bear market, suggests Hoye. In a post bubble contraction Hoye expects gold to do well. Moreover, Hoye notes that one of the key expense items in mining is the cost of energy. Consequently, a slump in crude should make gold mining more profitable. We rather prefer playing the gold share side rather than gold or silver. But they have to be traded. From buying them on an oversold condition and taking some money off the table when they are over bought. Hoye is rather concerned about the bond market in China. They have a huge problem in the corporate bond market. They issued too many, the default rate is going up and prices are going down. He is also amazed at the vacancy rate of apartments in China at 22% which represents 50 million apartments. The whole world is all wrapped up together. You had a fabulous bubble and it has had a significant hit, a liquidity problem from which it will get some relief. And also this will feedback into housing prices. When you have a great financial mania such as what we’ve been in, the price of other assets get bid up and then when the financial markets change and you go into the contraction, most asset prices get bid down. So how do you make money in such times? Hoye's formula is to have a model that gives you a pretty good path on where things are likely to go, and back that up with technical analysis to give you the oversold or the overbought conditions. Generally, Hoye suggests in bear market, sell the rallies, but for gold stocks buy the dips. 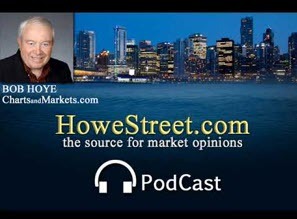 In early November Hoye says they positioned a modest amount of gold stocks. They haven’t had any urge to trade out, but at some point, they will add and give themselves more of a representative weighting.